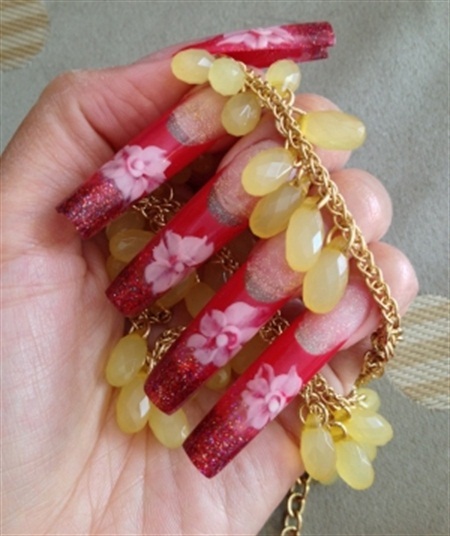 Former Kupa Inc., master educator Sindy Mark recently branched out on her own to start a nail art-focused education program called The Nail Art Academy. Based in San Francisco, Calif., the classes she offers are designed to help students increase their technical and creative skillset and increase income by adding innovative nail art to their service menus. Q: What is your background as a nail tech? A: I have been a licensed cosmetologist since 1996, but I focused only on hair styling for the first two years. I found that it was difficult for me to be as creative and expressive with the clients’ tresses as I wanted, and standing on my feet and always lifting my arms was very strenuous on my body. So I decided to tap into the nail industry along with my sister, Kiry, who became a licensed nail tech to take over our mother’s salon in Las Vegas. We learned very quickly that this is our calling. 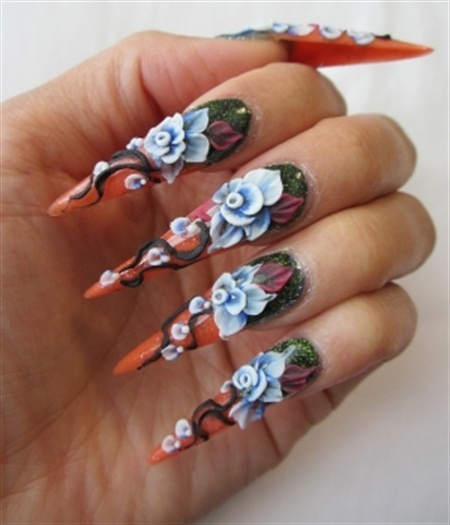 Right away I found my artistic flair, and I turned the basic nail salon services into a custom nail experience by offering all sorts of nail art and embellishments — from hand painting to 3D to airbrushing — and creating nail lengths and shapes that were not offered at other salons. Q: How long have you been an instructor/educator? A: Technically, I have been an instructor/educator for about four years — before with Kupa Inc., and now with my own education program. Before then, I was an educator for my own staff in all my salons; we would do one day a month of training in the salons. All my techniques and design elements were self-taught, and all my years of salon experience taught me to become more efficient in the services I provide. I developed specialized training to teach my staff in all my salons my techniques and design secrets, and that helped me gain the confidence to become an international educator and expand my teaching to other nail artists. Q: When and why did you decide to launch your own nail art academy? A: My decision to start The Nail Art Academy was a decision I made after working with some of the industry’s top manufacturers and realizing that there is a lack of education on technical and artistic skills that is non-product related. I started the academy in January 2014. After resigning from KUPA Inc. as their director of education, I realized that I truly love teaching and developing training that will help professional nail techs and nail artist improve their skill to earn more income in the advanced services that they can provide to their clients. I decided to have an academy so that I can continue to teach on a smaller scale. Q: How is having your own training program different from working with Kupa Inc.? A: Working with KUPA Inc. was absolutely a great experience. The difference is that KUPA is all product related. They have the largest selection of KUPA-branded nail products and tools any nail tech would need, so the training is specific to their products. Although I am not specific to any product line, I do tend to train with KUPA products and E-files and tools just because I believe in their products. At The Nail Art Academy we focus more on the application technique and art design utilizing mixed mediums, and I am able to share with my students the products and techniques I love to work with. Q: Why did you decide to become an instructor? A: Earlier on in my career there was no such education available to us. We did not have social media or product companies traveling and training us on how to use their products correctly. So I had to do a lot of trial and error myself. I decided to become an instructor because I wanted to share my skills and techniques with others so they wouldn’t make the same mistakes I did without proper training. Q: What’s unique about your teaching style? A: Our classes are designed for private one-on-one training or in small groups, so that individualized attention is given to every student. The students are given a guideline to follow throughout the course, but we typically customize the training based on the students’ learning ability and speed to advance to the next level. Q: What’s your favorite lesson to teach and why? A: My favorite lesson to teach is 3-D acrylic applications and special effects. It’s the most exciting lesson for everyone. Students love to watch and learn the secrets of how to create those 3-dimensional designs and embellishments. This is usually the highlight of the course, and the result is dramatic for each student. I love to see the creativity and talent each student expresses once they are given the right tools and guidelines. Q: What is your least favorite aspect of teaching? A: My least favorite aspects of all is when students feel defeated and disappointed that they are not good enough. Everyone learns differently and at a different pace. That’s the reason our classes are small and attention is individualized. Q: Do you have any specific teaching tips for other instructors? A: My best tip is to teach students what is relevant to the times and offer refresher courses for graduates to continue to perfect their skills. Q: How do you keep students’ attention if you feel they are tiring or losing focus? A: If that happens, then it’s time to either take a mental break or to move on the next subject. Our classes are small so we are able to retain students’ attention and focus for each lesson. Q: What do you find most rewarding about being an instructor? A: The reward starts for me every time a student registers for our courses. That means they want to learn specific training from our academy with classes and training that I personally developed. Q: What advice do you have for other instructors on improving the student experience? A: My advice would be to host an interactive classroom setting, focus on the students learning abilities, and teach what you specialize in. With those things in place, you and your students will have a great experience. Dates for The Nail Art Academy classes are posted on www.thenailartacademy.com.